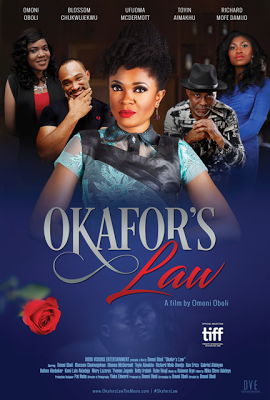 Who is Anticipating Omoni Oboli’s Next Movie, Okafor’s Law? Star actress and producer, Omoni Oboli gearing up for the cinema debut of her next movie, Okafor’s Law on March 31, 2017. Omoni has enjoyed many successes and goodwill from cinema lovers but who is anticipating the release of her next movie? Omoni who has produced ‘Being Mrs Elliot’, ‘First Lady’ and ‘Wives on Strike’, and has starred in many movies to critical acclaim is set to lay claim to the box office throne again as Queen of Box Office. Her directorial and production skill has been tested and confirmed through her continuous box office records smashing and the successes her movies enjoy. Her upcoming movie, Okafor’s Law is the story of a man who believed that if a man has bedded a woman once, he can do it again and again regardless of anything. It brings this true by telling the story of Chucks (Blossom Chukwujekwu) nicknamed by his friends as the Terminator, an ardent player with ladies, whose quest to proving this law to his friends brings him three women he must re-seduce: Ify (Ufuoma McDermott), Tomi and Ejiro (Omoni Oboli), whose lives have drastically changed. And this must be done within 21 days. This challenge of their various new statuses makes his quest to win the bet more and more insurmountable as he tries to prove the immortality of the long age law: Okafor’s Law. The question remains, who is anticipating this next box office wonder from Omoni Oboli?